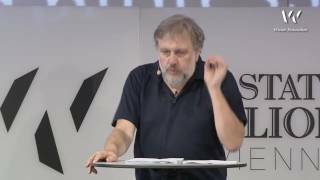 Slavoj Žižek (born 21 March 1949) is a Slovenian psychoanalytic philosopher, cultural critic, and Hegelian Marxist. He is a senior researcher at the Institute for Sociology and Philosophy at the University of Ljubljana, Global Distinguished Professor of German at New York University, and international director of the Birkbeck Institute for the Humanities of the University of London. His work is located at the intersection of a range of subjects, including continental philosophy, political theory, cultural studies, psychoanalysis, film criticism, and theology.